I'm sorry for the fact that I haven't been posting regularly, but I'm so busy doing this big assignment for school!! Today is the last day, that I can work on it so tomorrow I'll be one free girl and a crazy blogger (I promise).. Tomorrow will be celebrated with hot cups of chocolate, last christmas shopping with my boyfriend and preparing for a christmas party at school with the lovely Cecilie!! I for one can't wait, and I promise you that good photos will come out of tomorrow for you to see! wow die glitzerhose ist so schön!ich weiß auch immer noch nicht ob ich Litas toll oder doof finden soll.ich würde sie mir nicht kaufen so viel steht fest, ich finde sie einfach zu hoch. aber so an anderen können sie einen echt zum staunen bringen, mit ihrem mega-plateau und dem hammer absatz! 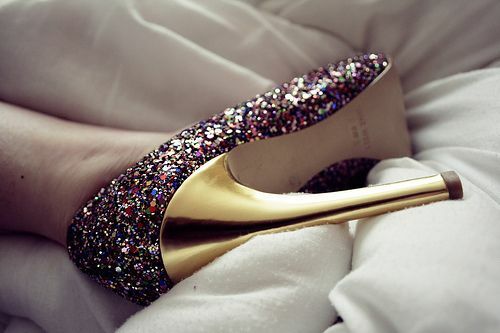 Well, I'm inlove with all the pairs, but I would definitely pick the glitter and flowerish ones. They are perfect and one of a kind. 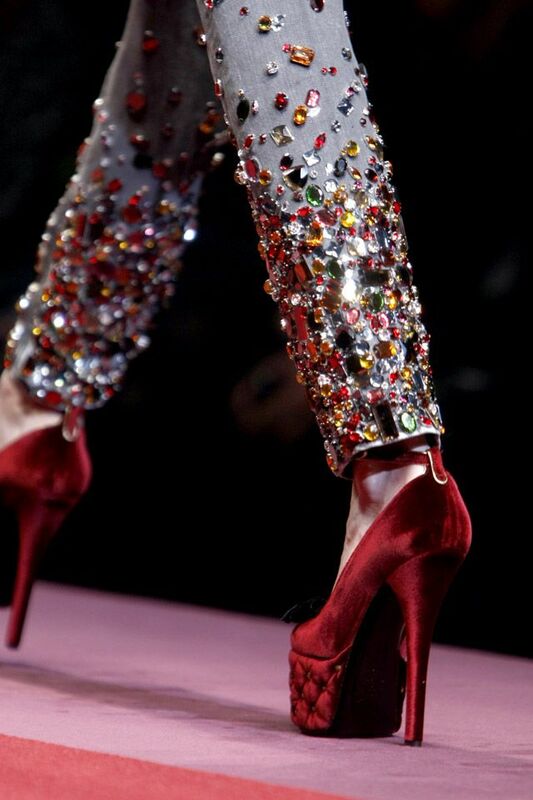 I love the dolce and gabbana pic from the runway!! Love the heels! I morgen bliver en lykkens dag ;) <3 Jeg glæder mig! IMORGEN SARAH, IMORGEN! :D Og jo, jeg elsker JC-skoene ;) vil gerne selv have et par! The first blue ones are to die for and i love the flowery ones as well! We should follow eachother on bloglovin! the second pair of sand colored heels is beautiful! Held og lykke med beslutningen!